I’m on a mission. I’m on a mission to do better when it comes to shopping for groceries and planning meals. I don’t know about you, but I tend to plan new meals each week and build my shopping list around those NEW meals. The truth is, I never look for sales in the weekly ads (yes, this horrifies my Mom). I don’t do coupons (I can’t even keep up with my keys much less remember coupons). I don’t eliminate new meals that call for a specific spices I’ve never heard of, which ultimately means I have to buy that new spice in addition to the other ingredients I probably don’t have on hand. I’m trying to change all of this, which I’m finding just takes some discipline, thoughtful preparation, and sacrifices (organic vs. non-organic, fresh vs. frozen, etc). With Martin Everitt starting school and the fact that we are expecting another little one in July, I know that I have to begin saving and developing a new love for leftovers. This is one area I know that if I spent a little more time, I could make a difference in my budget AND on how much I throw away each week. Last week was a great lesson in all of this. I had a dinner party at my house where I cooked a TON of Homesick Texan’s Houston-Style Carnitas and my friends brought all of the fixings. We ate off of that one meal all week. Well, until Thursday. By Thursday I was D-O-N-E with the Carnitas. Before I planned out this weekend’s shopping list, I looked at what I had in my refrigerator before going to the grocery store. A novel concept, I know. I froze some of the food I was tired of for later (another concept many of you know well, but I always “mean to do it” and then forget and then it is too old to freeze). People, I used a sharpie on freezer bags. This is HUGE. Okay, back to the fridge: I noticed half a bag of cabbage left over from last week’s slaw for the Carnitas. Next thing you know it, I’m looking for recipes for leftover cabbage. I spent Friday night (wait for it……wait for it……) looking at weekly ads to map out my other recipes for the week. I know, I know…my Friday nights are so exciting I don’t even know how I deal. Some of this may sound privileged and I’m fully aware of that. You see, I’m not thumbing my nose at leftovers. It’s not like I’m purposefully wasteful. It’s just that I get easily distracted, overwhelmed with every day stuff like many of you, and end up putting things off until I am shamefully throwing food away. Working at a Food Bank has been incredibly eye-opening for me, which also challenges me to be a better steward of the things I am fortunate to have. On that note, let’s talk about coupons: Most of the coupons I’ve found are for highly-processed foods or foods I don’t normally eat, which complicates matters at well. It is incredibly frustrating for so many families, I know, but I also recognize that I’m fortunate to even have the CHOICE to pay for the kind of food I had to buy while on Weight Watchers (reduced-fat cheeses, etc). Most families do not have that choice, which requires its own post, honestly, because we could spend time talking about Alabama’s grocery tax, the high cost of food, the way our food system works so inefficiently, and how parents/guardians have to make sacrifices DAILY in order to simply feed their families. Well, then. Let’s get back to the recipes, shall we? I settled on four main ingredients that were on sale): ground turkey, ground beef, beef for stew, and rotisserie chicken. 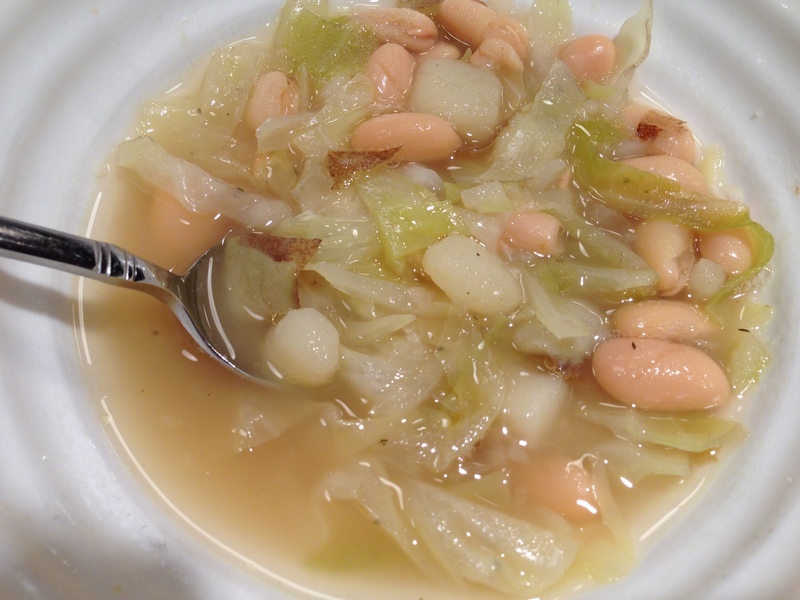 1) Rustic Cabbage Soup from 101 Cookbooks (I pretty much had every ingredient minus a few cans of cannelloni beans). The week is already off to a good start because the Rustic Cabbage Soup and Sloppy Joes were a big hit and I have enough left over for the next couple of days. I’ll fill you in on the other recipes later in the week. Oh! I also saved money at the grocery store, which for a family that eats almost every meal at home (because we totally do), that’s a big deal. This soup seems rather basic at first glance, but it has great flavor. I have a confession: Instead of using the herb bouillon she mentions, I broke the vegetarian rule and just used what I had on hand, which ended up being chicken stock and “Better Than Bouillon: Chicken Base.” I’m glad I did because it added great flavor. Have you tried Better Than Bouillon? You should! I’m sure you can tweak the recipe to keep it vegetarian if that is important to you. I didn’t even need the Parmesan cheese at the end, which saved some calories. 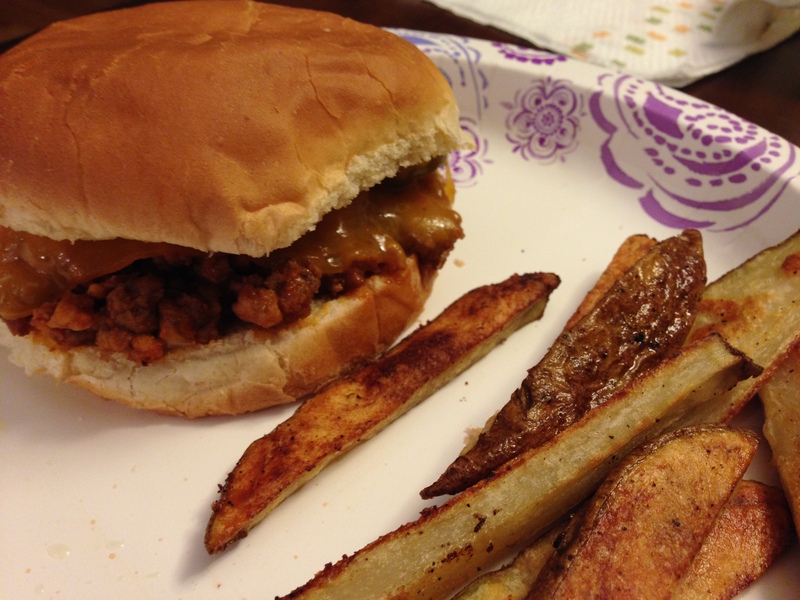 I’ve made these Sloppy Joes MANY times and they are a big hit in our household. I usually follow the recipe closely, but this time I added a few tweaks that worked! First, I used ground turkey and lean ground beef primarily because they were on sale but also because I like NEED to reduce the calories where I can. Instead of regular chili powder, I used Hot Mexican-Style Chili Powder because that’s what I had on hand. I also used more tomato paste this go ’round, which worked much better. I probably ended up using 3-4 tablespoons. I also LOAD up on the Worcestershire sauce (I dare any of you to try to spell that without looking it up). You just need to play with this recipe each time because some people like their Sloppy Joes sweet, some like them spicy, and some like them more tart (mustard-y). It’s up to you! Side note: I may have added a slice of cheese to our sandwiches (see above). And…and…and…let’s not forget about the fries. I cannot believe how the homemade BAKED french fries came out! I just cut them skinnier than I normally do, tossed in olive oil, salt, and pepper, then baked on the lowest rack at 400 degrees for 20-30 minutes (I flipped them half-way through the cooking process). I feel like I accomplished what I set out to do: To create meals with enough leftovers, use what I already have on hand, and save money at the grocery store. Now I just need to keep it up! Good for you!! 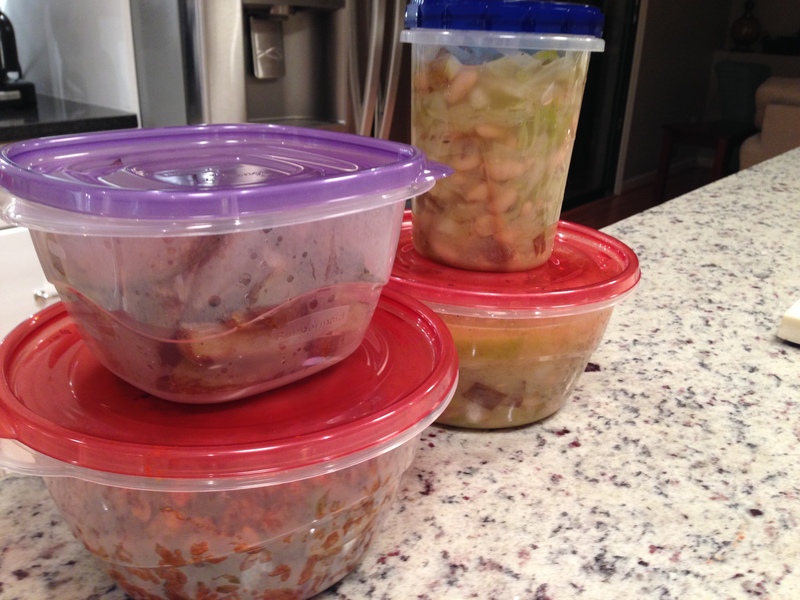 A little meal planning definitely does go a long way, even if the process can be torturous. For freezing things, a FoodSaver could be a great investment. It vaccuum seals everything so you can literally keep leftovers for a year/buy meat in bulk to save, and they don’t go bad. Really good idea about the Foodsaver. I tried freezing a few things a few weeks back and ended up not getting a lot of the air out of the bag. I hate freezer burn. I’ll out a FoodSaver on my wish list!